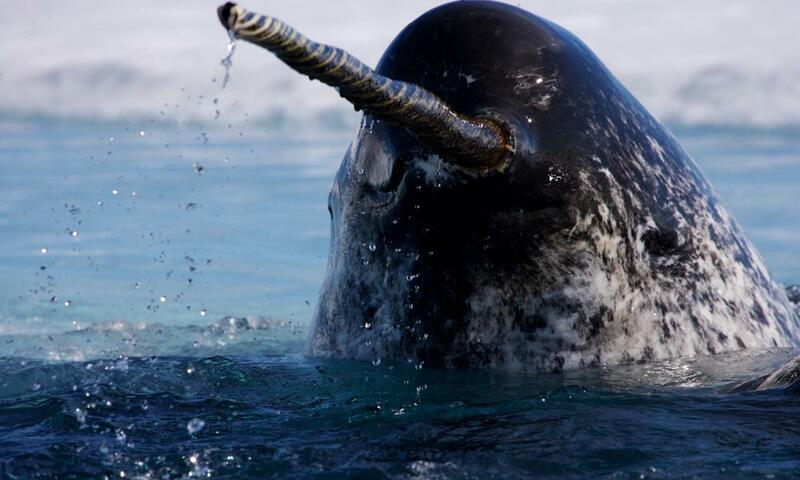 Today I want to write about the unicorn of the sea, the amazing narwhal. These amazing whales grow up to 5 metres long from head to tail. The narwhal tusk is actually a very long tooth that grows from the left upper jaw of males. These tusks grow up to 2.5 metres long. Sometimes males grow 2 tusks and sometimes females grow a tusk as well. Zoologists still aren’t sure why they grow them. Narwhals eat shrimp, fish and squid, swimming up to their prey and sucking it in to their mouths. They can dive to a depth of 1,500 metres and can stay underwater for up to 25 minutes. They live in small groups of about 10 animals and can gather in much larger groups of over 1,000 during the summer months. Narwhals are found in the freezing cold Arctic waters and the north Atlantic Ocean around Russia, Canada, Greenland, Norway and Alaska. They used to be hunted for their tusks, but are now protected. Are there any other interesting facts that you would like to share about narwhals?